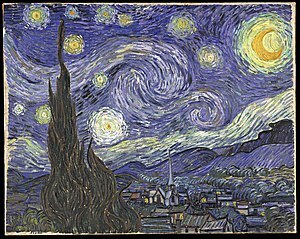 The first time I saw a painting by Vincent Van Gogh (1853-1890), I was dumbfounded. I just couldn't believe that anyone could produce anything that beautiful and it brought me very close to tears. After that, I became a Van Gogh fanatic. I couldn't get enough of his paintings and then, I discovered the writing. Vincent Van Gogh’s letters, most often to his brother Theo, are often heart breaking and very often inspiring. According to the Van Gogh Museum in Amsterdam, there are over 900 surviving letters. 819 letters written by Van Gogh, and 83 letters to him. “I shall count myself very happy if I manage to work enough to earn my living, for it makes me very worried when I tell myself that I’ve done so many paintings and drawings without ever selling any. Don’t be in too much of a hurry to consider this an injustice, I don’t know anything at all about it”. You'll never get a better insight to the mind of an artist or a human being as through Van Gogh's letters. I’m going to start reading them again. It’s been a while and I need a dose of Van Gogh. The Van Gogh Museum in Amsterdam has an amazing web site where you can read the letters (English translation) on line. If you have any interest in Van Gogh, you mustn’t miss visiting this site for the vast amount of information they provide. There are also numerous editions of the letters available from book shops or Amazon.